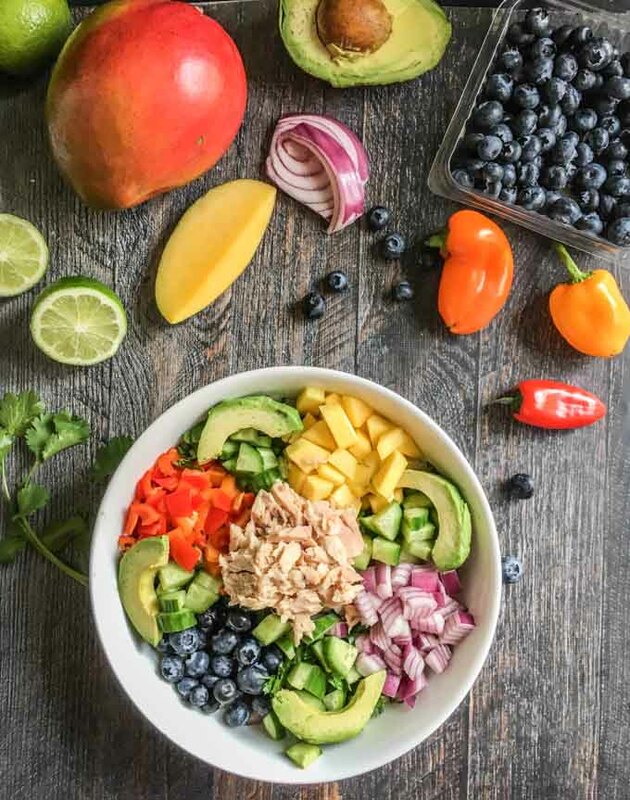 This Paleo mango salsa bowl with tuna is a colorful bowl of healthy goodness! Makes for the perfect quick and easy lunch or even dinner. Thank you Bumble Bee® Seafoods for sponsoring this post. I’m a long time user of Bumble Bee® Solid White Albacore Tuna and highly recommend it to you. 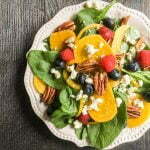 Now that spring is here I start to think more about salad and less about soup, especially for lunch. 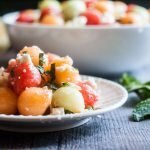 I recently made a fruit salsa that I really love (my coconut shrimp with mango salsa ). Since then I’ve been adding more and more fruit to my salads along with my favorite veggies. So today I have for you my Paleo Mango Salsa Bowl with Tuna. It has color, crunch, chew, sweetness, creaminess, meatiness …. it has it all. And it highlights albacore tuna which is something I always have on hand to add healthy protein to my salads. Let’s talk about this salad, shall we? We always hear “eat the rainbow” to make sure we are getting all the nutrients we need, well I got you covered here. *See bumblebee.com for full nutritional facts. When it comes to tuna, I prefer albacore tuna to chunk light tuna. It’s much meatier and tastes a lot better in my opinion. Nobody wants to have mushy, watery tuna on their salad, at least I don’t. So I always keep a couple cans of Bumble Bee® Solid White Albacore Tuna in my pantry. 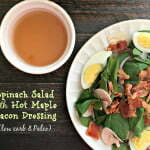 I mostly use it in salads but of course there are lots of great recipes you can use with it. Check out Bumble Bee®’s website to get some more recipe ideas and to see why Only Bumble Bee® Albacore Will Do™. 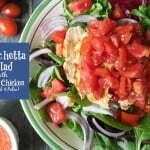 There is a curry tuna salad recipe on there I can’t wait to try . The base of this salsa bowl is riced cauliflower. You can buy riced cauliflower in most grocery stores but it’s easy to make at home. Just add florets to your food processor and pulse until it’s in tiny bits. I don’t precook mine as I like it crunchy but you can microwave it for a few minutes if you want it softer. You can also use lettuce as the base if you prefer. This is were the fun begins, at least for me. I love making smoothy bowls and this salsa bowl is no different. On the bottom I have layered the parsley and cilantro. On top I have added cucumbers, avocados, blueberries, red onions, peppers and mangoes. 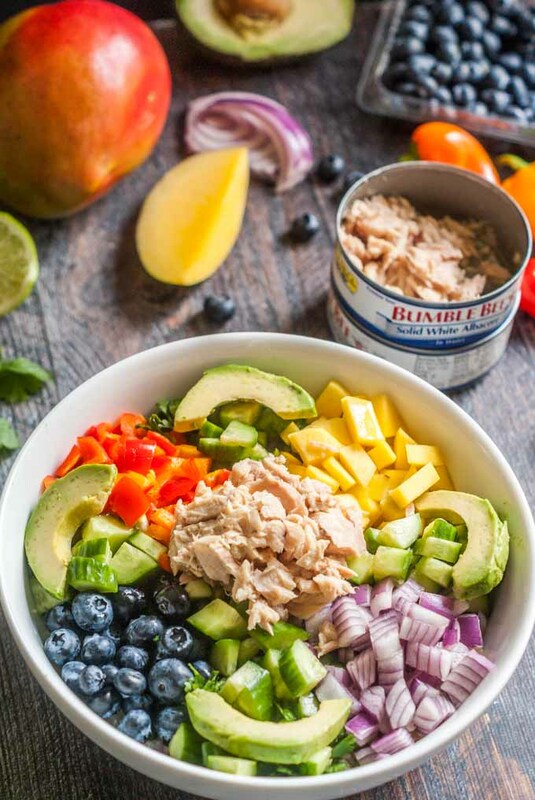 In the middle is the star of the bowl – Bumble Bee® Solid White Albacore Tuna. 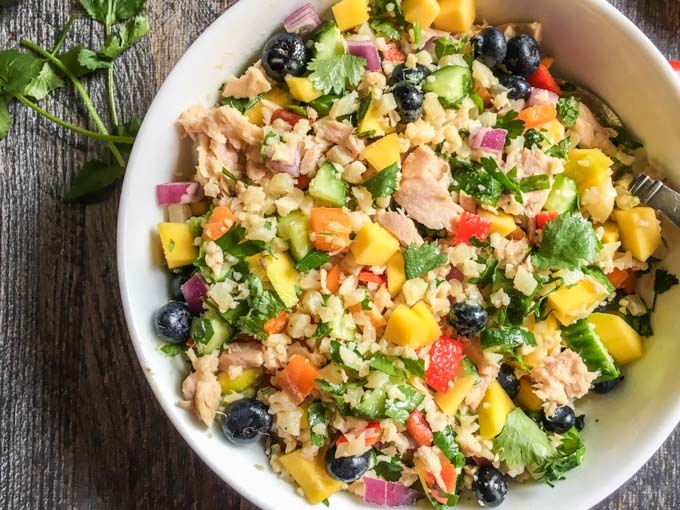 The meaty tuna perfectly complements the fruit and veggies. The dressing is a simple mixture of lime juice, orange juice, olive oil, garlic, salt and pepper. I like to mix mine up like the pic above but eat it anyway you like. I sometimes squirt a bit a lime juice on top instead of the dressing to make it even lighter. Well I hope you like this salsa bowl. This is a recipe you will thoroughly enjoy and feel good about eating. 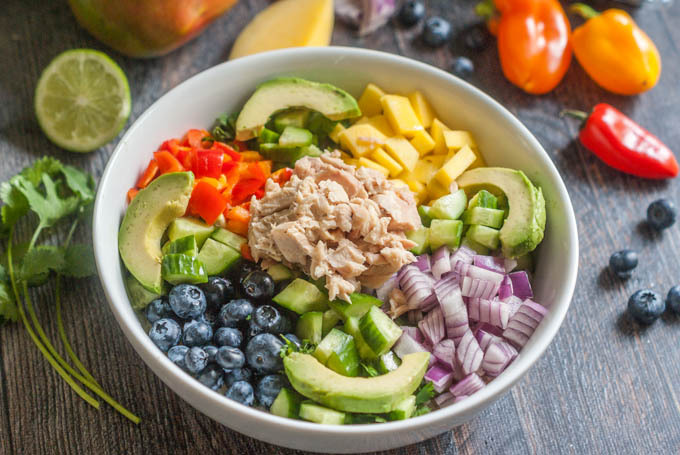 This Paleo mango salsa bowl with tuna is a colorful bowl of healthy goodness! Makes for the perfect quick and easy lunch or even dinner. In a large bowl, spoon in your riced cauliflower and smooth out. Mix the parsley and cilantro together and add to the bowl in the shape of cross. Spoon the onions, peppers, mangoes and blueberries into each of the 4 empty spaces. Place the chopped cucumber over the cross made of herbs. Add the avocado slices around the bowl and spoon the tuna in the middle. Whisk the lime juice, orange juice, garlic, olive oil, salt and pepper to make the dressing. This is a sponsored post written by me on behalf of Bumble Bee® Seafoods. I really enjoy their white albacore tuna and hope you give it a try. Me too…actually I have been eating this quite a lot lately! I love all of the ingredients you used, so much great flavor! It sounds and looks delicious and still so healthy, yum! It is healthy but it’s very tasty too. I love all the colors and the crunchy! I love salads like this, so colorful and healthy! Looking forward to the warmer weather and fresh veggies and fruits. I agree. This will be perfect in summer time with fresh garden veggies and fruit. That bowl is like a rainbow! It’s so pretty! 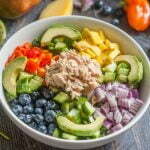 My husband LOVES tuna and I love literally everything else in this bowl so I might have to make this! I love tuna too! Especially albacore tuna because it’s so meaty. I eat ALOT of salads and it’s nice to know I always have a meaty protein in the pantry. My go to salad used to be tuna, walnuts, blue cheese and assorted veggies. Now I’m thinking I need to start adding more fruit to my salads. It gives it that bit of sweetness and tartness too. 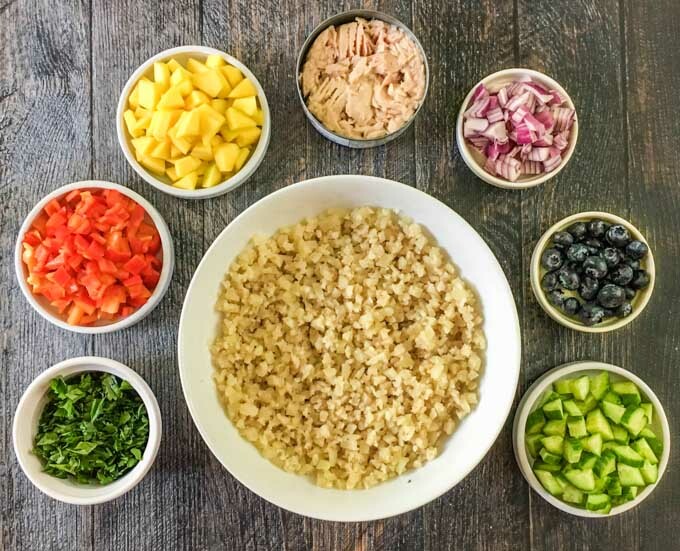 I love keeping tuna on hand for quick lunches, but all these additions – oh my! So wonderful! I would seriously be so happy to sit down to a bowl of this any day.